Google Text-To-Speech is one of the most realistic TTS application ever. It is a screen reader application developed by Google for its Android OS. This application converts text into speech supporting different languages. It powers different applications to read aloud the text on the screen. Applications like Google Translate, Google Play Books, Google Talkback & after one of it’s most recent update, many other third-party apps that support both text selection and sharing have become compatible with it. But the user first needs to install voice data for each language. Many app developers have started adapting Google Text To Speech such as Whatsapp, it reads notifications aloud and also provides voice reply functionality. Text To Speech Discord is also one of the greatest one, specially for a gaming community. The app is quite useful as it is used for reading the pronunciation of words, reading translations, giving turn-by-turn navigation, reading books, & improving the accessibility across the whole system. You can select the entire article & Google TTS read it for you, the voice quite resembles real human voice. Google is adding new languages on a regular basis. Scroll down to see the currently supported languages by Google TTS. You can easily download it from the PlayStore, If you haven’t installed the latest version, Download it now. Currently it supports the following languages: Bangla (India), Cantonese (Hong Kong), (Bangladesh), Czech, Dutch, Danish, English (Australia), English (India), English (United Kingdom), English (United States), Filipino, Estonian, Finnish, French (Canadian), French (France), Greek, German, Hindi, Hungarian, Italian, Japanese, Javanese, Khmer, Korean, Mandarin (China), Mandarin (Taiwan), Indonesian, Nepali, Polish, Portuguese (Brazil), Romanian, Russian, Norwegian, Sinhala, Spanish (Spain), Spanish (United States), Sundanese, Swedish, Slovak, Thai, Vietnamese, Ukrainian and Turkish. How To Enable Google Text-To-Speech? 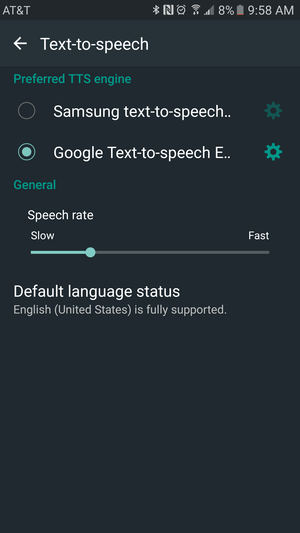 For enabling Google’s Text To Speech, Open Settings > Accessibility > Text-To-Speech Output. Maybe your smartphone manufacturer has its own TTS option, so you can switch to the Google TTS. If you want to change the language also, you can do so from here, if not then keep it default only. As you can see in the above image, there is one more option of speech rate, it helps to control the speed of your device to speak your text. Slide the bar to the right, to fasten the speed. Additionally, if you want to make it sure, that you receive voice updates, then just open Settings, then enable the Auto-update voices. If you want to force updates over Wi-Fi, then you can also enable the second option. 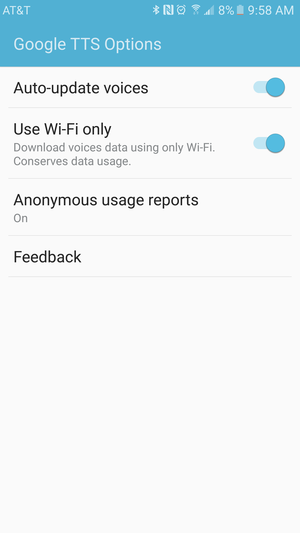 There is one more option available to you, which you can turn on if you want to send anonymous usage reports to Google, for the improvement in Services. Significantly in 2018, Google has shown many improvements, like Performance Improvements for 64-bit devices, improvement in several voices, all voices for a particular language are now downloaded together to save device storage. Still, there are many alternatives available. We may write an publish on the alternatives of Google Text To Speech, in the coming future. I hope this article would be helpful for you. Feel free to comment if you have any queries. Or you can even directly contact us using the contact form. I am the founder of Tech Toogle, A blog where I write a few words aiming at igniting knowledge of Technology.